Wind energy is getting cheaper and demand is on the rise. But planning and constructing a wind farm is a complex task. Thus, several forecasts show that the growth potential of onshore wind continues to be great. The International Energy Agency (IEA), for example, predicts an almost 40% increase in just four years, from 433 GW in 2016 to 602 GW in 2020. Growth will be strongest in developing countries, but even in a relatively mature market like Europe, the increase will exceed 20%, from 141GW to 170 GW. However, planning onshore wind farms is increasingly challenging. Smart energy systems are necessary to optimise wind energy use. And optimising wind farm construction is also far from easy. Legislation and the surrounding environment form a multi-faceted net of political, ecological and socioeconomic boundaries. “In many EU Member States wind farms face regulatory challenges,” says Benjamin Wilhelm, spokesperson of WindEurope – formerly the European Wind Energy Association: “In Southern Germany, for instance, the distance between a wind turbine and residential areas must be at least 10 times the tip height. And in the UK, developers face tip height restrictions and cannot build structures taller than 125 metres,” he continues. According to Benjamin Wilhelm, a closer collaboration between governments, citizens and the wind industry helps optimise the planning and produce the best technical solutions. Stefan Chun, General Manager at Ramboll Energy, agrees. “Involving the local community is crucial in the planning of onshore wind power and is something that hasn’t been done in the past,” says Stefan Chun. “Making the local community a part of the development process raises awareness about the planning process and fosters ownership and collaboration. "Other physical challenges also need to be addressed: Environmental assessments now encompass not only wind and groundwater assessments but also geophysical and geotechnical analyses. In addition, when developing a complete wind power system, planners must address the design of aerodynamic blades, hubs, controls, supporting structures and the foundation. Further questions arise when road infrastructure and health and safety at the construction site are added to the equation. 10.4% of Europe’s electricity demand was covered by wind power in 2016. EUR 27.5 billion was invested in wind energy development in 2016 (5% more than the total investment in 2015). 51% of total power capacity installations in 2016 were wind power. * Note: These figures might underestimate growth, because the forecasts did not foresee the dramatic price decreases in the second half of 2016 and first half of 2017. 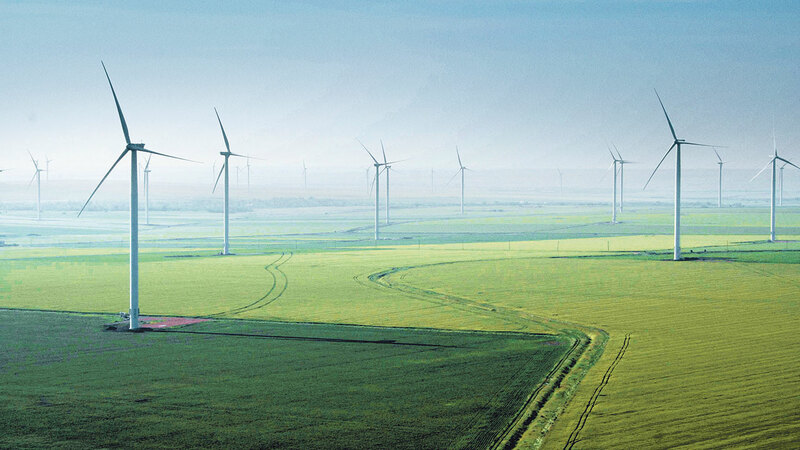 When an onshore wind farm is built, factors such as landscape, vegetation, groundwater, wind and soil conditions have to be considered, along with legislation, road infrastructure, distance to housing, construction site safety and connectivity to the electricity grid.